In the premiere episode, Jonathan and Eddie embark on an epic journey of talking. Along the way they discuss themselves and their families, salivate over new iPad Pros, attempting to sleep a full night despite being fathers, getting derailed talking about their pets and how they influence their families, and finally why they don’t want to give Google information on their website visitors. IndieWeb - the personal website community Eddie and Jonathan met in. 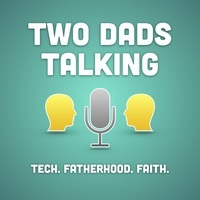 For past episodes or to subscribe to future episodes, visit us at twodads.fm.